The editors at artnet News searched New York City high and low for the most exciting, bizarre, and thought-provoking gallery exhibitions this fall. From Chelsea to the Lower East Side, we’ve got you covered. 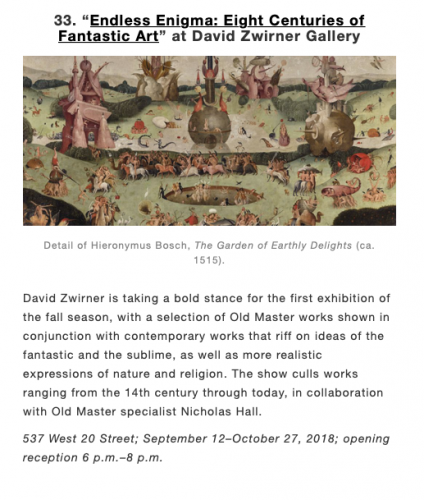 David Zwirner is taking a bold stance for the first exhibition of the fall season, with a selection of Old Master works shown in conjunction with contemporary works that riff on ideas of the fantastic and the sublime, as well as more realistic expressions of nature and religion. The show culls works ranging from the 14th century through today, in collaboration with Old Master specialist Nicholas Hall. 537 West 20 Street; September 12–October 27, 2018; opening reception 6 p.m.–8 p.m.